I’m amazed how many times a door was closed in my life, only to discover another door was wide open for me. Today will wrap up our week of success blogging. We discussed earlier this week Do You Know What It Takes to Build a Successful Life? (click on link) and The Framework of a Successful Life (click on link). 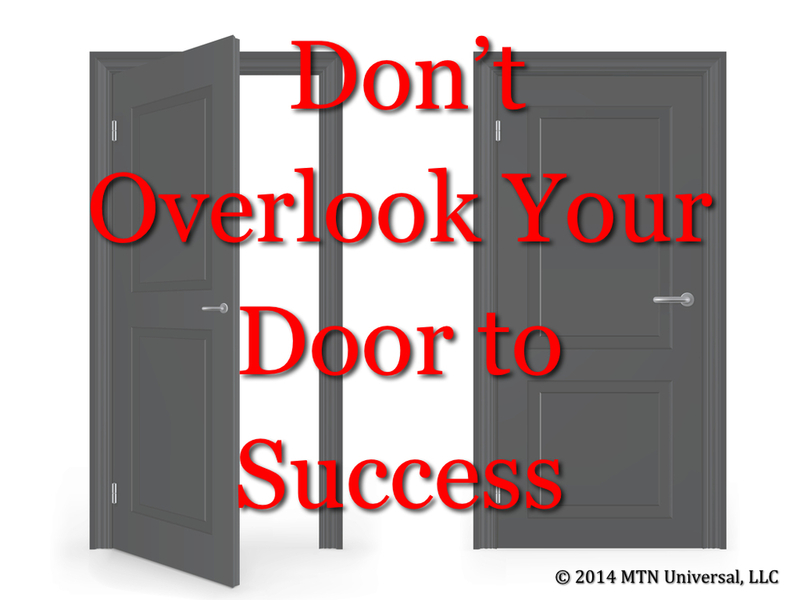 Today, let’s talk about taking advantage of your door to success. What do you do when you run into closed doors in your life? Many times we work so hard to open closed doors that we waste time and energy. Did you ever think that those closed doors in our life are closed for a reason? We all have missed out on a blessing before in our life. When we are so focused on opening a closed door, we miss out on two beautiful blessings. The first blessing is the door being closed. I look at it like this, God knows best. He had the door closed for a reason and it was for the benefit of my life. The second blessing is the open door. We can’t do anything about those doors that are closed in our lives. So, why not take advantage of the open doors in your life? If we would use the same energy to discover the open doors in our life, I believe success would come a little easier to us. Whatever you do, quit wasting time on the closed doors in your life. Accept that the door is closed for a reason. Rather than fighting and attempting to bust down a closed door, instead look around and search for an open door. Once you have discovered the open door, walk through it. We think we need to bust down the closed doors because we feel there’s a bigger blessing behind the closed door, but it is a false reality. Remember, the closed door is closed for a reason and the open door is open for reason. Don’t let the closed door control your life. With that said, even if the door is open we must find the power in our minds to walk through it. The open door will be have less resistance, which will make us feel uncomfortable about believing the open door is for us. However, that is the reason why you should walk through the open door. The open door was open specifically for you. I say all this because I have wasted time banging on doors that were closed. I’ve attempted to bust down these doors because I thought my blessing was behind that door, but God gave me revelation. I stopped fighting what wasn’t for me and accepted what was for me. And ever since, I have been blessed with success beyond what my mind can comprehend. I’m now ready to walk away from the closed doors of my life and walk through any door God has opened for me.